And then as many good ideas do, it got pushed aside and I never made it. Then a few weeks ago, I found sausage marked down at my local Kroger and immediately thought of this recipe. I pulled out my sheet pan, loaded it up with the sausage and peppers and popped it in the oven. To say that the kids loved this recipe is an understatement – they INHALED every last bite! 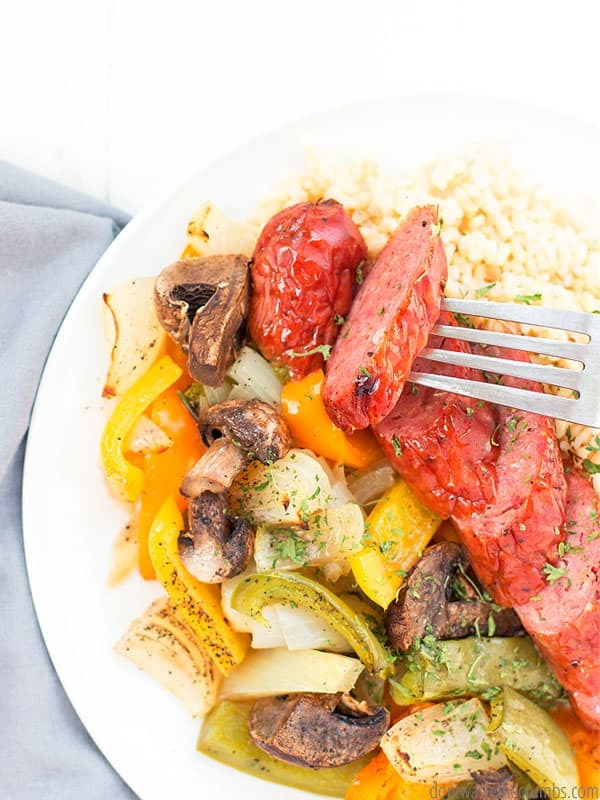 They literally jump up and down and say this is the best sausage and peppers recipe ever, so that’s how I know I have to share this recipe with you! I was in total agreement with the kids too. Not only was dinner DELICIOUS, but sheet pan sausage and peppers is SO easy to make. It takes barely any time at all to get all the ingredients on the sheet pan and once you set the oven timer, you’re free to walk away and do something else. I absolutely LOVE when dinner practically cooks itself! What is Sausage and Peppers? Now I have to confess that the first time I made this, the sausage and peppers didn’t exactly fill up my sheet pan. I mean, it’s just farmhouse sausage links (or bratwursts) and bell peppers, right? You see, I have these half-sheets made by USA (LOVE THEM!) because while my kids aren’t teenagers (yet), they definitely can hold their own at the dinner table… ESPECIALLY when I make sausage. The problem with the sausage and peppers not filing up my sheet pan is that’s how I gauge how much food I need to make in order to fill everyone up AND have some leftover for a lunch. In my house, a half pan won’t cut it. And I know from experience that vegetables only shrink when they cook… so that meant beefing up this recipe another way, but still keeping the easy factor. That’s when I thought about onions and mushrooms! We add onions to almost everything we make, and since we did the Whole30, we’ve become very fond of mushrooms, too. 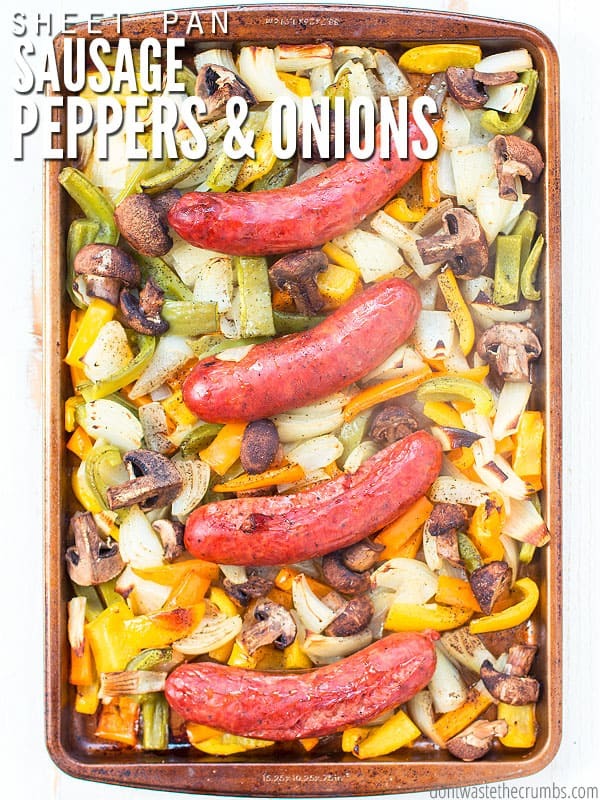 Since I almost always have both on hand, I figured, why not make this sausage and peppers and onions and mushrooms?! So much so that now we make my weeknight creamy mushroom pasta at least twice a month, and mushrooms are the main star!! 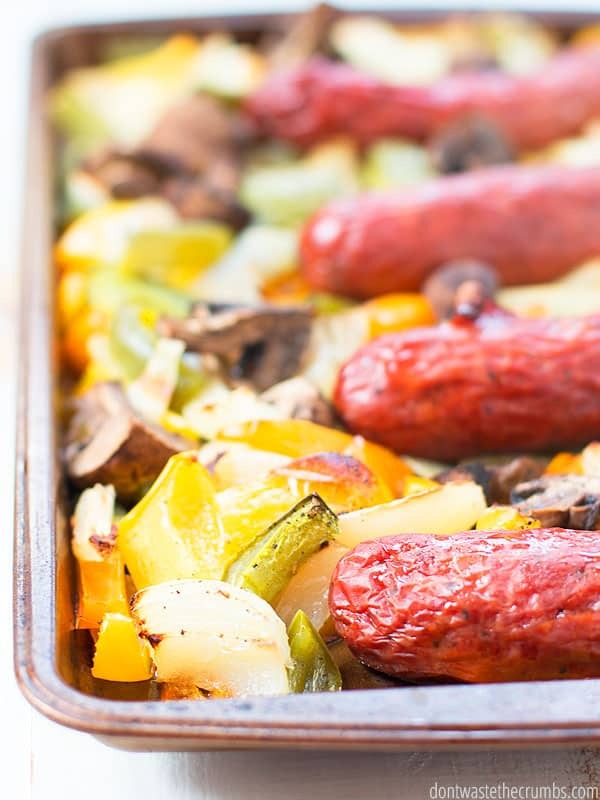 If your family is a hard no against onions and/or mushroom, pretty much any vegetable will work here… Brussels sprouts, zucchini, yellow squash and cauliflower immediately come to mind as a great pairing for sausage! Wonder if sausage & peppers can be frozen? YES! I’ve made this numerous times from a frozen state and it comes out AMAZING every time! That’s one reason why I included it in my One Hour Freezer Cooking: Dump Dinner Recipes Plan! You can find this recipe in our Dinner Dump Freezer Cooking Meal Plan along with 4 other easy dinner recipes like the Very Best Slow Cooker Carnitas, and Sheet Pan Sausage and Peppers, and Slow Cooker Salsa Chicken and Homemade Hamburger Helper HERE and have 10 dinners ready in just ONE hour! I’ve also made this using fresh sausage and a bag of frozen peppers and onions. Still good folks – feel free to cheat! How much sausage and peppers per person? This is important, because while you can easily gauge the number of sausages (we usually plan one sausage per person), gauging the vegetables is much harder. I suggest allowing 2-3 cups of raw vegetables per person, because the amount will reduce significantly when it cooks. When I make this for my family of four, I cut up 4 peppers, 3 large onions and 16 oz of mushrooms. This gives us plenty of veggies for dinner, and hopefully some leftover for lunch the next day. What goes with sausage and peppers? What’s EVEN BETTER, is using this sausage and vegetables as a filling for sandwiches!! Use my homemade hot dog buns recipe, stuff it with cooked sausage and peppers and top with cheese (if you’re feeling like it) and OMGEEE…. That would be SO GOOD! What spices should I use to season sausage and peppers with? I usually keep it simple and use salt, pepper and Italian seasoning, but this would be a great time to use some of those more fun blends you might have on hand, like Chinese 5 spice or Za’tar or even homemade poultry seasoning. 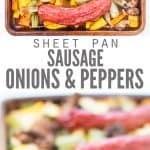 Can I make Crockpot sausage and peppers instead of sheet pan? Absolutely! If you want to turn this into a crock pot sausage and peppers dinner, just dump everything into the crock pot and turn it on high for 2 hours or low for 4 hours. That’s it! 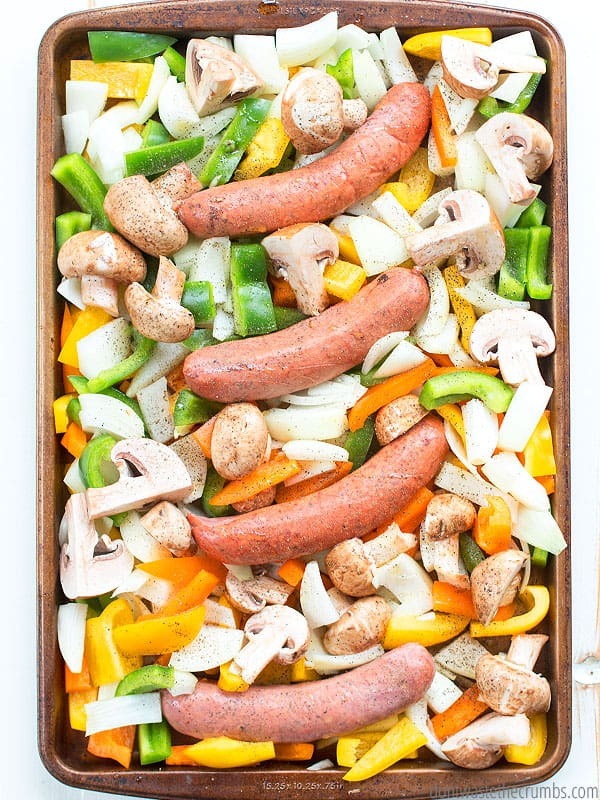 I will be honest with you, though – I think the best way to make sausage and peppers and onions and mushrooms is on a sheet pan. The sausages get golden and crispy, the vegetables cook down and get sweet– it’s really a match made in your mouth! Add all the vegetables to a large sheet pan (I use this large half sheet). Drizzle with olive oil and sprinkle with salt, pepper and Italian seasoning. Add the sausages in and around the vegetables. Bake until the sausages are cooked through and the vegetables are tender and slightly charred, about 40-45 minutes. If desired, serve with Instant Pot brown rice or a side salad. 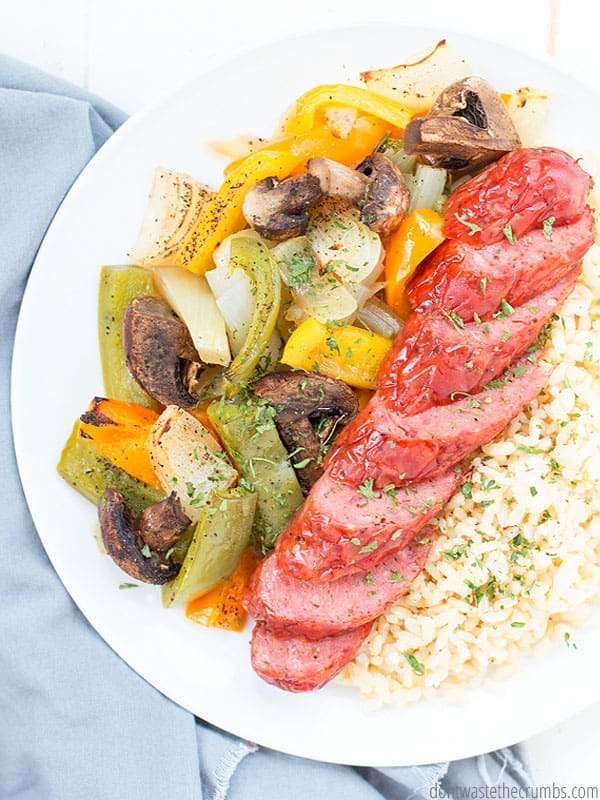 Now you have an easy, healthy, delicious sausage and peppers recipe for dinner! By the way, this dish is PERFECT for the freezer. So, you can put all the ingredients prepped in a bag and add to the freezer for later! Typically, I don’t like to freeze full meals and instead freeze meal components. Extra shredded chicken or carnitas are often found in my freezer. Use these freezer cooking tips to find out more! **If you’d like full meal plans with meals, grocery lists, and more (basically all the dirty work done for you), check out the Freezer Family here. How often do you make sheet pan dinners? Do you have a favorite recipe that you make all the time? Leave your ideas in the comments section below! you can also add canned potatoes, (or reg potatoes, but I think I would partially boil them) that would add substance.. I add potatoes to mine, when I doing Sausage and peppers, onions and potatoes! Do you have your vegetables sitting in a pile of grease when you do sheet pan recipes? I’ve tried some with chicken thighs, and it was kind of gross, but I love chicken thighs. It’s quite a dilemma!! Do you have a brand or recommendation of where to get Italian sausage without corn syrup? Hi Shaina! I’ve never seen sausage WITH corn syrup… I’d check the meat section of your local grocery store!